UPDATE: This event is sold out. Please scroll below for more details. Cash bar: On Saturday evening, your first beer from Maine Beer Company is complimentary, but after that, you will need to pay for beer or wine with cash. The closest ATM is 20 minutes away at Katahdin Trust in Patten. We highly suggest taking out cash before you get to the event. Getting to Shin Pond Village: Be advised that cell phone reception can be spotty in the communities surrounding the monument, so we suggest you print directions to Shin Pond Village (click link for directions), or save directions to your phone. If you’d like written directions, please email info@friendsofkww.org prior to the event. Parking: If you are driving to the event on Saturday evening, it’s important to park in the spots designated for the Anniversary Celebration. Admittance: You don’t need a physical ticket to get into this weekend’s events. We are maintaining a guest list so when you arrive, we will admit you and any additional ticket holders under your name into the event. Please reach out to info@friendsofkww.org if you have any questions about getting in. This is a sold-out event, so unless someone has a ticket reserved, we will not be able to admit them. 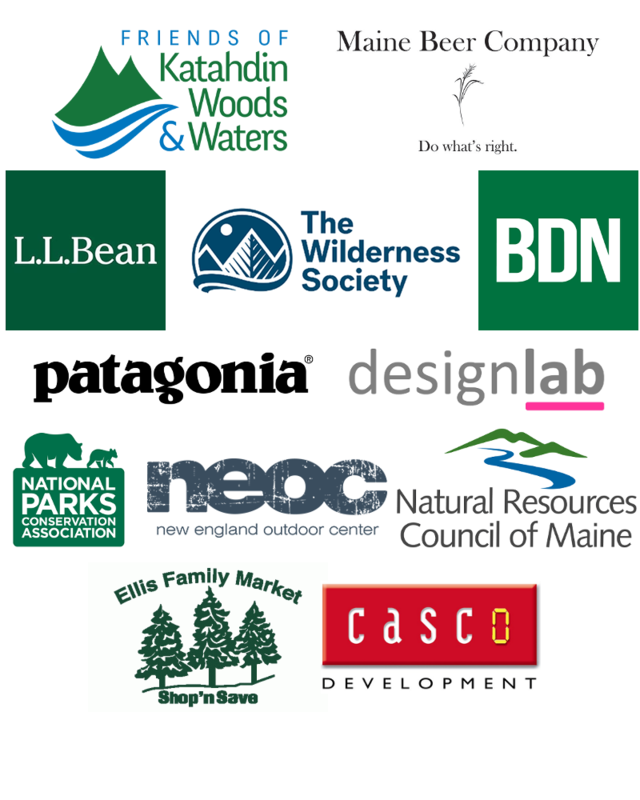 Silent Auction: The silent auction will include items and experiences from Patagonia, Moose Prints Gallery, New England Outdoor Center, North Light Gallery, Frenchies’ Natural Products, L.L. Bean, Maine Heritage Timber, Maine Beer Company, Shin Pond Village, Mt. Chase Lodge, Bradford Camps, Barbara and Bill Bentley, Moose Creek Signs, Memories of Maine, The Appalachian Trail Lodge and Cafe, Epic Sports, Elliotsville Plantation, Inc., Mainely Coffee, Trailside Country Store, and Red River Camps. Note on paying for silent auction items: While you will need cash for the bar on Saturday, you can pay for any silent auction items you may win with a credit card or check. While you’re in the region, explore the monument and surrounding communities with the help of L.L. Bean. Follow the link here to read about suggested “Be an Outsider” Trips and Experiences. We encourage attendees of our 2nd Anniversary Celebration who plan on staying overnight to book their reservations as soon as possible. Visit the Nearby Accommodations page for more information on reserving lodging. SOLD OUT EVENT: We are sorry to report that tickets for the 2nd Anniversary Celebration of Katahdin Woods and Waters National Monument are sold out. Out of respect for paying ticket holders, we will not be admitting additional guests on the day of the event. We are bound by a limited amount of food and space at Shin Pond Village. Thank you for your understanding. We will work to make sure the 3rd Anniversary Celebration can accommodate even more guests!